A walk Roundball Woods is guaranteed to lift the spirits whatever the weather, but a walk in the woods in May has to be the best. After a long winter the woods are alive with new growth. Bright green and blue are the colours of the month. Leaves and buds are now showing on all the trees and a generous sprinkling of violets cover the banks, hedges and hillsides of Roundball. It's the bluebells however that steal the show. 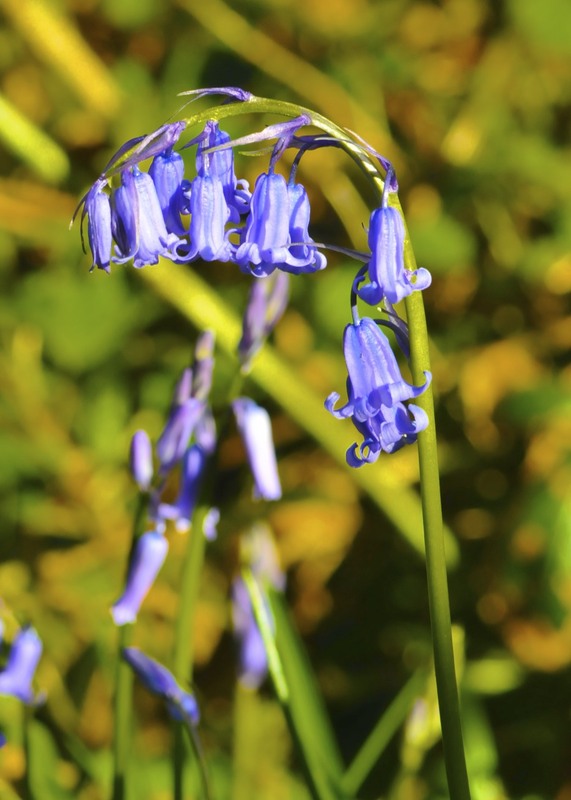 Britain has 60% of the world population of bluebells with the majority in the west of the country. Bluebells are flowering 2-3 weeks later this year but are well worth the wait. A walk through a bluebell wood on a warm May day is a treat for the senses. The combination of colours and scent of a bluebell wood is something to be savoured. It is also worth taking some time to get closer to the ground on your walk up the hill. 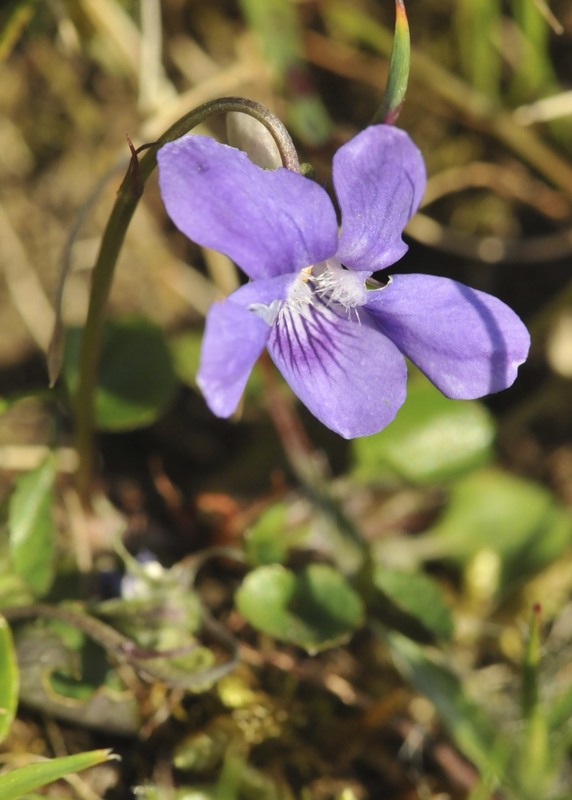 The violets along the hedge rows are also providing a scattering of blue in profusion not seen for many years and are flowers that deserve a closer look. So if you are feeling blue, get up the hill to the woods and give yourself a treat. Just don't forget to take your wellies. Come and join us in the woods. The wardens of Roundball Wood are organising a guided walk around the woodland at 2pm on Sunday 12th May. The walk, which will last for approx 2 hrs will be an opportunity to find out more about the woods, it's plants and animals and see the work that is currently being done to improve the footpaths. The Roundball Wood Wardens have now got their own webpage and blog which keeps people up to date with what's happening in the woods. QR codes have been placed on the entrances to Roundball and allow those with mobile phones to get straight to the website and blog. The blog can also be accessed via the Roundball Wood page on www.honiton.gov.uk. I'm a Queen Bee and it's all down to Me. On a visit to Roundball Meadow this week I stopped and watched a Queen Bumblebee for about 10 minutes. Keeping close to the ground the bee quartered the meadow passing many flowers without stopping, but always checking out bare soil and holes in the ground. Unlike Honey Bees which over-winter as a colony, in the Bumblebee world only the queen survives the winter. After hibernating underground or behind the bark in dead trees, the queen emerges to feed up and then find a suitable site to build a nest. 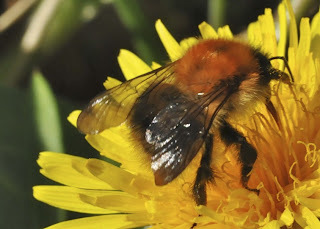 Using old mouse or vole nests, the bee creates a nest site in which she forms a small honey pot from secreted wax . She then fills it with nectar and having been fertilised by a male in the previous year, she then gets on with the business of laying eggs to form a new colony. The Bumblebee I watched was no doubt searching for a suitable nest site. A remarkable insect with a great responsibility. Being the sole survivor of her colony the creation of the new generation is all down to her. As a friend of mine said 'a woman's work is never done' . After waiting months for spring flowers at Roundball, they all come along at once. 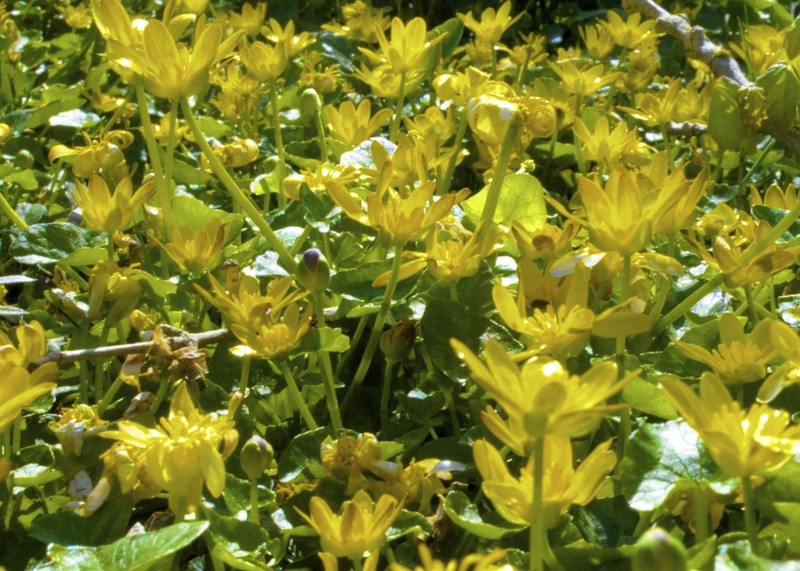 There is little doubt that the last few weeks has seen primroses, celandines and wood anemones in numbers that few peoples can recall seeing before. Plants are a lot smarter that we often assume, and after being held back by the cold spring they are making up for lost time. Their objective is to flower, get pollinated and set seed for the next generation, and are making the most of the good weather to get started. After putting up with all the cold and wet weather it's great to see the sun, and some locals have already been seen in Honiton High Street in 'T' shirts and shorts. We are making the most of the good weather whilst it lasts and the wild flowers at Roundball are doing just the same. It looks as if after waiting for so long, we are now witnessing one of the best displays of wild flowers for many years. It's been worth the wait. 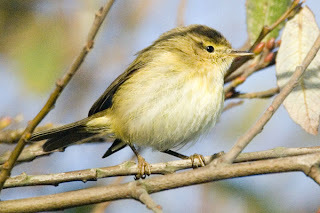 The repetitive song of the Chiffchaff is an indication that the first of Roundball Wood's Summer visitors has arrived. The Chiffchaff is a bird of mature woodland with good undergrowth, and is one of Roundball's breeding birds. Because of its small size and olive colouring, it is a bird that is easily overlooked when not singing. However it is common across the county, with Devon holding a large population of between 20,000 to 25,000. Chiffchaffs despite their small size are long distance migrants. Many overwinter in Africa, West of the Sahara. Those now singing in our woods and surrounding hedges arrived in late March and may well have set off on their journey back from Africa in February, stopping off on route to rest and feed up for the journey. In the past few years more and more Chiffchaffs have been over-wintering in the County. Being insectivorous they need a consistent supply of insects to keep them going in winter months. The places where there is a guaranteed all year round supply, are sewage works, and it is where you are likely to find the Chiffchaffs which overwinter. Roundball Warden has watched Chiffchaffs in mid-winter making the most of the rich pickings of flies that only sewage can offer. Kilmington and Branscombe works being favourite spots. Whether our birds spend the winter across the Sahara or across Branscombe sewage works, has yet to be established. Surviving a Devon winter or a long distance migration makes this a very special small bird. Sign of Spring or Cash Crop? 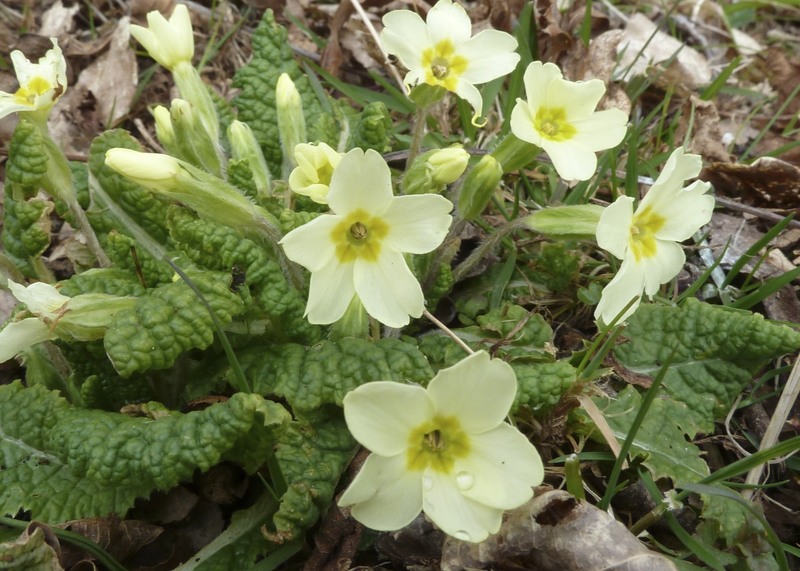 Primroses are one of Devon's signature flowers and are now at their best. The lanes around Roundball are full of these flowers and are a sign that at last winter is over. There was a time that they were not just an indicator of spring, but also an opportunity to make some pocket money. As a child Roundball Warden together with his younger sister, picked bunches of these flowers, tied them up with cotton and went around to neighbours selling them for cash. Neighbours were not the only customers for primroses in Devon. Devon Valley Paper Mills at Hele near Cullompton, sent primroses to the buyers of their paper to give them 'a breath of Devon air'. Although I never sold mine to the paper mill, I know some who made a fair bit of spare cash from the operation. The practice spread to other paper mills and in the mid 1960s the venture received bad publicity in the local press from those who were concerned that the Devon lanes were being stripped of blooms. To address these concerns, Plymouth Polytechnic was invited to look into the practice. Their conclusion was that the level of picking was not a serious threat to a plant that lives for about 15 to 25 years. However over the subsequent years the general attitude of the public towards picking wild flowers hardened, and in 1968 a law was introduced to make the picking of wild flowers for commercial gain a criminal offence. Roundball Warden now has to appreciate primroses in all their natural beauty rather than calculating how much pocket money he could make from a hedge full. 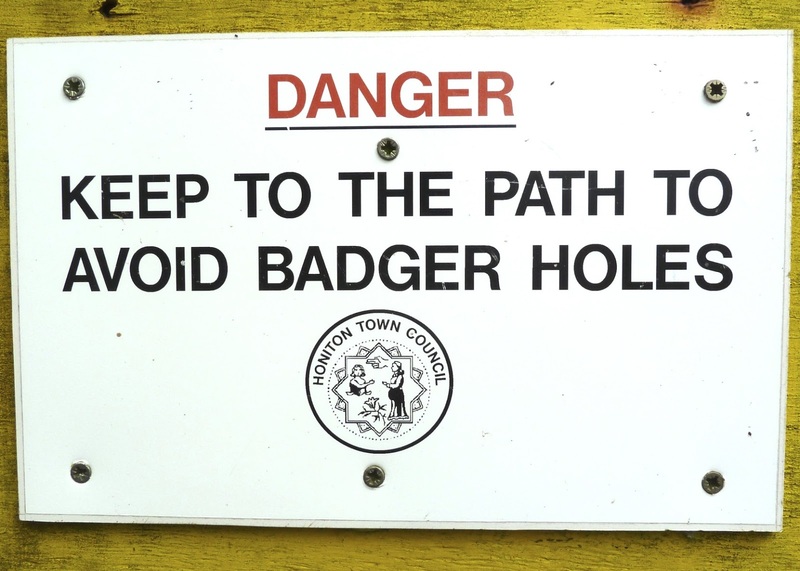 One of the questions that Roundball Wardens are often asked is whether there are still badgers at Roundball? A walk up through the woods and along the top meadow will reveal entrances to badger setts that look to be unused and overgrown. In fact the badger holes protected by signs in the meadow show no sign of use except by rabbits. However if you look closer along the boundary of the woods and the meadow and along the hedges adjoining Roundball Hill you will see plenty of evidence of recent badger activity. 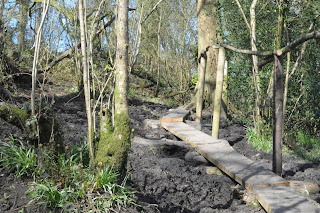 If you approach Roundball Hill via Roundball Lane you will see a large sett entrance to the left of the steps. It stands clearly with recently excavated sand and often fresh badger footprints. This sett entrance is 300-400 yards from the sett entrances in the woods the other side of the hill and poses the question is this the same sett. Survey work related to bovine TB in 1977 resulted in a number of badger setts being excavated to see if gassing with cyanide gas would be effective. 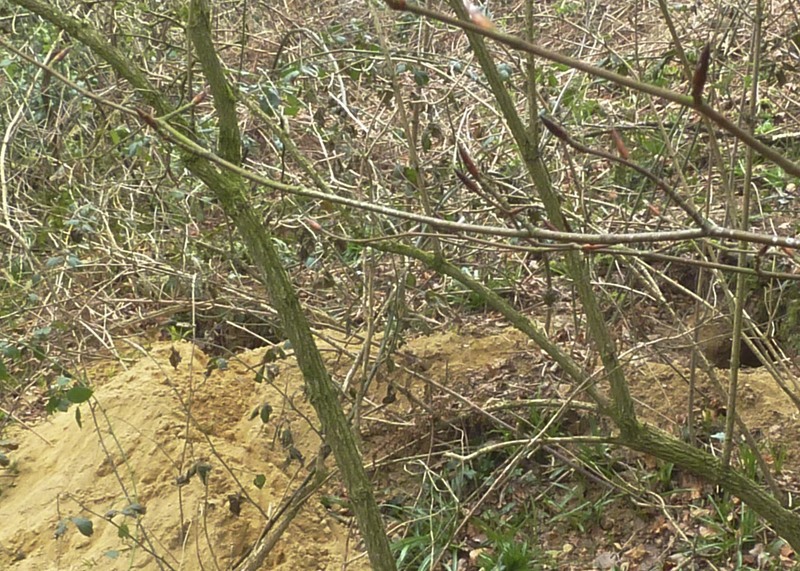 From this work a typical sett was found to have 38 entrances, 78 chambers and 360m of tunnels. Subsequent excavation work in 1990 estimated a sett as having 178 entrances, 50 chambers and 897m of tunnels. This would suggest that the entrances at Roundball Lane and Roundball Woods may well be part of the same sett. 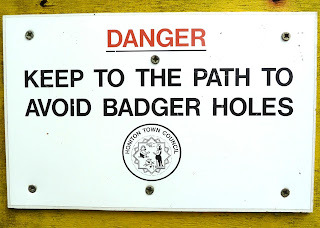 Setts are not only valuable to todays badgers They can be centuries old and are a valuable resource handed down from generation to generation of the same badger social group. We can only be grateful that there are not more active entrances to trip us up in the top meadow. So for this, thank you to Mr & Mrs Brock and family.